Have Woodstock-era Moog synthesizer? Will travel. Kaitlyn Wagner, an undergraduate composer in UNCG Music, took UNCG’s classic Model 12 Moog synthesizer with her to the National Student Electronic Music Event in Bowling Green. The invitation to present a composition at the conference was quite an honor, said Dr. Mark Engebretson, director of the A.V. Williams Electronic Music Studio at UNCG. Her composition, “I, Philip,” uses not only the Moog but also a Korg Analog Sequencer, Live electronic processing and multi-channel sound. “It’s an homage to minimalist composer Philip Glass, in that the sequencer functions much in the same way as the compositional technique called ‘additive process’ which was pioneered by Glass and other minimalist composers in the 60s and 70s,” she says. What’s that? “Granular delay works the same way as sampling, except rather than playing the samples at speed, they are split into small “grains” or pieces each around 1-50 milliseconds. ….The granular effect is introduced gradually throughout the piece and when the tempo of the sequencer is slowed down, the effect really comes into its own.” You can hear the composition here. A recipient of the Holt Music Scholarship, Wagner is a winner of the Harold Schiffman composition competition. 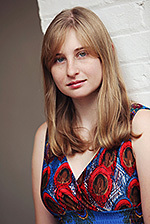 She was the youngest featured composer at the 2013 Charlotte New Music Festival, where one of her compositions was performed by the Freya String Quartet. Among others who’ve performed her works are the Cleveland Institute of Music, the Oasis Saxophone Quartet, J.W. Turner of the College Music Society, and violinist Sarah Plum. Learn more at www.kaitlynwagnermusic.com. Hear her present “I, Philip” Tuesday, March 31, at 7:30 p.m. in the UNCG Music Building’s Recital Hall. The concert is free-admission. Additionally, in April, the piece’s namesake, Philip Glass, will visit UNCG. See details here.